When PHOTOGRAPHER Kit Constable Maxwell's father brought SWB petrol Land Rover CFA 612 in 1954 to replace their Willy's Jeep, it soon became clear to Kit that this was a very special vehicle, and was just the beginning of a long involvement with the marque. Kit learnt to drive CFA 612 around the fields at home and had soon come to appreciate the superior level of sophistication over the Willy's Jeep; the Land Rover even had a heater. But it was the result of a trip to Solihull in 1956 to have the CFA 612 serviced that Kit fully realised the Land Rover's potential. He was given a demonstration of the vehicle's capabilities by the Special Projects Manager at the Land Rover test circuit, an assault course of mud, trenches, fords and inclines. "As the Land Rover roared up a 1 in 1 slope, I decided that this was the only vehicle worth having" says Kit. CFA 612 was replaced in 1958 when Kit's father brought a blue and white LWB Petrol station wagon. This vehicle was converted under factory licence to a Dormobile, and was at the time one of the ultimate travelling LWB's, capable of sleeping four in total comfort. After one terrifying night in a hurricane at Stornaway, Kit's father was so alarmed that he never camped in it again. The LWB was demoted to rounding up sheep on the estate, no doubt dreaming of more exiting adventures. However Kit's appetite had been whetted, and in1969, now married with two small children (including the author of this article), he bought a limestone LWB 6cyl petrol station wagon and drove the family to Nepal and back. The vehicle was converted with the help of Land Rover Special Projects Division: A box section was bolted to the roof holes, and the roof put on top of that. "it was the worlds ugliest Land Rover" declared Kit, "but the extended box section had it all.. two beds, two toy boxes, 27 cubic feet of storage space and room to stand up straight". There were an additional two beds "downstairs" as well as running hot water (achieved by tapping the engine block), air conditioning (from a Cadillac), and even a connection for an electric toothbrush. A total of 500 feet of wire was installed to operate the numerous circuits. Once the heavy duty springs, larger fuel tank, and higher spec tyres had been fitted, the adventure began. The trip took the family through Yugoslavia, Turkey, Syria, Iran, Iraq, Afghanistan, Pakistan, India and Nepal. The sight of four redheads in this extraordinary Land Rover was greeted with many surprised gasps, especially when seen reversing for maximum traction up the steep slopes of the Dragon Valley in Afghanistan and buying a carpet at the top to sleep under because it was so cold. The high altitude of over 11,000 feet meant that the conditions were very tough, but the Land Rover mercifully soldiered valiantly on through the Hindu Kush, otherwise we may have been left at the mercy of bandits. The extra height of the vehicle meant that a number of interesting detours had to be made around low bridges. One particularly effective "extra" was the rear door mounted washing machine. Dirty laundry was loaded with soap and water into the plastic tank, and after a few hours hard driving the laundry emerged spotless! When we finally arrived at Kathmandu on New Years Eve, the trusty Land Rover was left under armed guard at the King's Palace while we celebrated. At the end of the trip, back to England six months after we had left, the Land Rover had traversed 17 countries and 25,000 miles faultlessly, except for one puncture in Yugoslavia. Unfortunately there have been few opportunities to do an identical trip since 1970 due to the ever-fluctuating political climate. 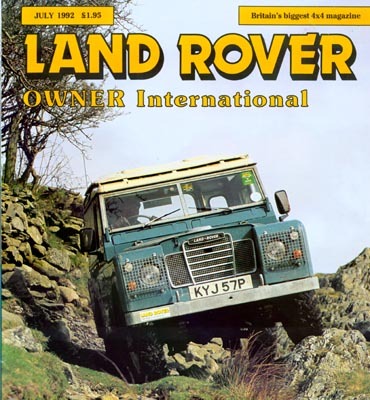 After replacing the front shock absorbers, the Land Rover was sold to a character who drove it to Africa, and Kit was left with the dilemma of what to replace it with. At the same time a new, untried product had just been released to the public: The Range Rover. "I hadn't really thought about getting one until a friend of mine turned up and drove it at 90mph across a stubble field in total comfort". Remarked Kit "I was amazed; the Land Rover had only managed 58mph". He immediately ordered one, in Sahara Dust. "Here was a vehicle that could do everything". In 1972 OOR 300L was the only vehicle that could travel 500 miles, fully laden with the family and an Irish wolfhound, in total comfort on the motorways up to the West cost of Scotland in time to catch the tide and ford the loch to reach the cottage at the other side, before the water level rose above thirty inches. The Range Rover was defeated only once, when it got bellied down in soft mud. "It was a race against time to dig the car out before the tide rose and we would be submerged" says Kit. OOR 300L continued in the tradition of camping vehicles. It was kited out with two beds, a cooker, running water and a television. "It was cheaper than getting baby-sitters in for the children". The spare wheel was mounted Land Rover style on the bonnet but when it came to grief at Windsor Safari Park when a Tiger jumped onto the bonnet and bit through the tyre; the blast of compressed air that hit the beast in the face was enough to send it running for cover. We also noticed that the large door handles were very easy to pull open from the outside, as a bear opened the passengers door! Needless to say we didn't invite him in, but rapidly sped off. A design fault perhaps? 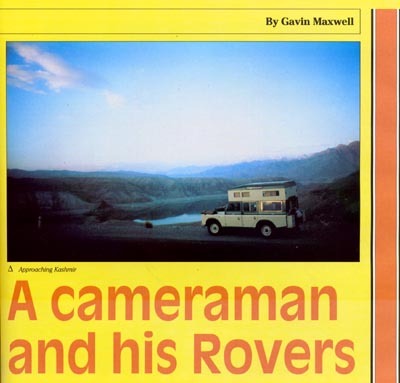 The next Range Rover arrived in 1975; "A friend of mine wanted me to tow a twenty five foot caravan to Saudi Arabia, and I immediately suggested that I could only do the job with a Range Rover, " stated Kit. "We brought, a Bahamas Gold one, with the luxuries of power steering, velour seats and carpets". 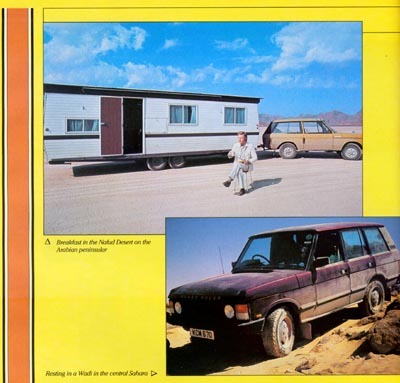 The unmodified Range Rover was then driven the 5,000 miles to Jeddah. The trip took him over the Taurus mountains of Southern Turkey, where briefly abandoned broken-down vehicles would be robbed of wheels, engine and gearbox. 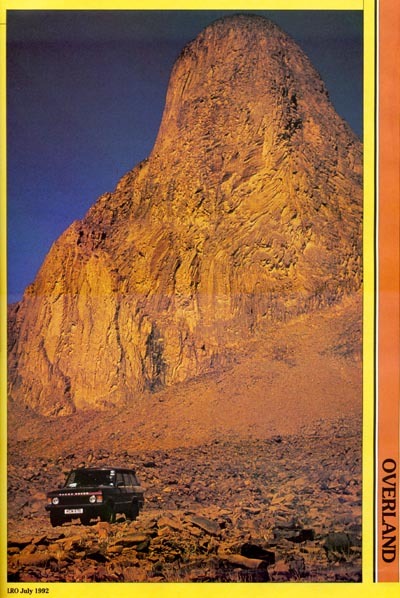 The Range Rover continued through Syria, Jordan, and across the spectacular scenery of the Nafud desert where parts of the road were obscured by sand dunes. The driving was very difficult due to the terrain and the weight of the enormous caravan, but again the dependable Range Rover design performed impeccably. The caravan was duly delivered to the client in Jeddah, and Kit spent a few weeks camping in the Range Rover on the shores of the Red Sea before selling it. 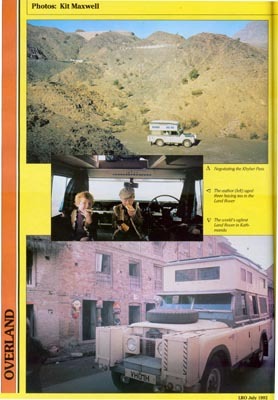 "Mine and the British Ambassador's Range Rover were among the first seen in Saudi Arabia", observed Kit . At this time he launched a commercial and industrial photography business in Jeddah. "By 1980 Range Rovers were far more numerous". Kit's third Range Rover arrived in 1983, having been previously owned by the Lord Lieutenant of Hampshire. This model was brown and equipped with Fairey overdrive. "It was full of cobwebs", remarked Kit "hardly used at all". It was soon regularly seen fording the Loch in Scotland, and transporting a derelict Lamborghini which Kit had brought as a restoration project. On a trip to Switzerland in winter the abnormally low temperatures froze the antifreeze, and the water pump had to be replaced. A new one was obtained and installed within four hours, thanks to the efficiency of the Range Rover dealership. Unfortunately at the same time Kit broke his leg skiing; his last memories of the car were sitting in the boot with his leg in plaster. As a result a major Range Rover trip was postponed. In 1986 Kit brought a silver 4 door Vogue 5 speed. "The comfort and standard was streets ahead of OOR 003L, " Kit declared. Although this was an up market machine it was certainly not treated like one. The Range Rover was taken to Devon to sample the delights of David Bowyers Off Road Centre which proved to be a thoroughly worthwhile exercise. "The course is excellent", says Kit, "pleasurable and instructional. Not since the Solihull assault course had I ever been so impressed by what these vehicles are capable of doing". The skills learned at the centre began the craze of Green Laning. Every weekend the family would put a picnic basket in the boot and head off in search of the most inhospitable stretches of mud and slush that could be found. The highlight for Kit came when the Range Rover bellied down, losing all traction in a notorious quagmire; "Hooray! Now we can try out the new high lift jack and winch". The mud encrusted Vogue Range Rover became a familiar sight in the Hants and Berks Rover owners Club, regularly competing against highly modified off-roaders in trials, including third in class at the Ham Lane trials. When not charging through muddy terrain, Kit designed a series of interconnecting parts to convert the Vogue into a fully specified camper vehicle, which was then used for camping holidays in France. Kit's fifth, and final Range Rover to date was subjected to one of the toughest tests of all; a trip across the Sahara Desert. However , this vehicle was no rough and ready off-roader, but a Cassis coloured 1987 automatic Vogue Efi. Again the new levels of comfort, equipment, and refinement were way ahead of all the previous models, as was the price. The up-rated suspension transformed the handling, but Kit felt the Efi was only a little bit faster than OOR 300L: "The Range Rover went slower and slower due to their power-sapping emission equipment, but the Efi's performance was at least improvement on the earliest ones". 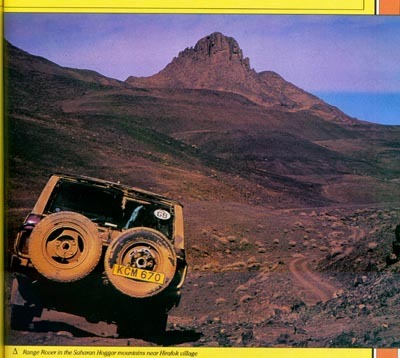 For the Sahara trip the Range Rover was to be as near standard as possible. The first thing to be removed, however, was the front spoiler, and a sump guard was installed, as well as a long range fuel tank thermostat heater, additional battery with charge splitter, two spare tyres mounted on the rear bull bar, and a host of spare parts such as spark plugs, points, distributor cap, rotor arm, leads, hoses, as well as oil, petrol and water cans, and a foot pump. The high-lift jack was an essential item also. The air intake had to be modified because it was being fouled by the position of the second battery. Kit's self-designed slot in parts from the silver Vogue transformed the Efi into a luxurious camper. Once loaded up with baked beans and pot noodles the vehicle was ready for the 9,000 mile, three month trip. The trip took Kit through the desolate expanse of the desert, travelling for ten days without seeing anyone. He was thankful for the protection of the sump guard and services of the high lift jack when the vehicle became impaled on an unfriendly rock. Many people have undertaken similar trips through the Sahara in poorly prepared or incompetent vehicles, doomed never to leave. On one particularly difficult section, known as the "moon flats", it was necessary to have police permission at Illizi before attempting a crossing. When the police learnt what vehicle Kit was taking they replied "ah, oui, Range Rover, c'est bon!" Needless to say permission was granted, unfortunately some valuable camera equipment was stolen from the vehicle right outside the police station. The lessons learned at David Bowyer's course and the independent suspension of the Range Rover proved invaluable. While driving in convoy across the sea of dunes the Range Rover's running gear proved itself again and again, frequently having to pull embarrassed Toyota Landcruisers owners out of the treacherous ruts. Kit was particularly impressed by the automatic gearbox, which he said reacted faster and more ably than he ever could . For example, when skimming over the surface of the sand the vehicle would suddenly sink into deeper sand; the immediately change down the auto box ensured that no momentum was lost. Needless to say the Range Rover excelled itself, taking everything in its stride. "On the journey back through Europe I drove it at 100mph, and took it to London as soon as I returned to England", says Kit. The only giveaway was that the air conditioning unit was blowing out sand and dust for weeks afterwards. 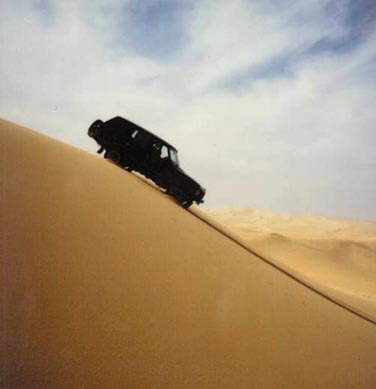 From learning to drive on Land Rovers to one of the earliest Sahara Dust coloured Range Rovers to one of the latest Range Rovers blowing out Saharan dust, and from Asia to Arabia to Africa, few people have had as much experience, use and enjoyment from Rover's vehicles as Kit. However, he feels that the Range Rover is the machine to have. "No vehicle possesses the unique qualities that a Range Rover has. Nothing has the ageless lines, or the class. I would never wish to choose anything else".